I use the term "news" loosely. 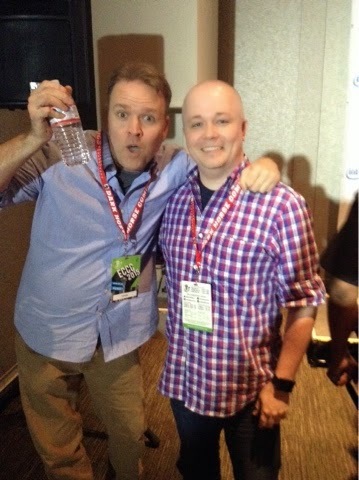 As you may have noted, I met both Jeff Parker... the now former Aquaman writer... and Cullen Bunn, the upcoming Aquaman writer. Jeff didn't have a lot to say, as he is off the book... but he did tease me with the news that a new book, title still unannounced, he is working on will feature Mera in the opening story. So keep an eye out for a new book from Jeff. Cullen had very little to say because, frankly, he can't spill the beans about a book coming out more than two months from now. His vague comments were along the lines of "big changes" and "shocking new developments" with the goal of shaking up the book and getting people to give it a shot. He said there is a costume redesign, but couldn't tell me how extreme or minor it might be. He did mention that Aquaman will not be getting along with Atlantis... which is not a new thing for the character by any means, but depending on the angle could certainly be interesting. But the information I got was very vague and sparse. Which, in the end, is fine by me. I don't much like spoilers and even avoid reading the solicits too closely before the book comes out.